Thermal stores are becoming increasingly common in domestic renewable heating technologies! or stove lends to a home. The good news is that it is possible to link up an open fire or stove to your heating system and enjoy the benefits of improved heating and better control over your heating costs. Existing gas or oil central heating systems can be adapted or extended, giving the advantage of dual fired heating with the added pleasure of a real fire. What are the benefits of link-up? An open fire or roomheater fitted with a back boiler can be linked up alongside the existing boiler in such a way that you can use either, or both, to provide the heating and hot water you need at any given time. The existing central heating boiler continues to service the system with hot water as necessary. The radiators, adjusted to the desired temperature, can be heated by your open fire or by the existing boiler or a combination of both. 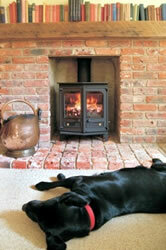 'Link-up' can be installed so that the open fire heats either or both the hot water cylinder and the radiators. Solid Fuel Link Up Systems - It is possible to link up an open fire or stove to your heating system and enjoy the benefits of improved heating and better control over your heating costs!